Session length, clicks, and product views are among the most actively tracked ecommerce metrics. And for good reason, too. Whilst numbers vary greatly, most e-tailers report that their average session duration is between 2 to 5 minutes. During that time, a customer will browse multiple product pages, mere clicks away from conversion. online visitors even before they abandon their cart. Beyond simply tracking these metrics, merchants and marketers can inform their merchandising and marketing with these web behavior insights. Why not resurface popular products in your next email? The first step is to implement web tracking script on your site – this can be done manually via your CMS or Google Tag Manager. Both methods are referenced in our support implementation guide. Once the script is live you’ll start collecting session data (from contacts who’ve clicked through from an email) in your WebInsights. One contact can have many web sessions, and each can have multiple page visits recorded. There are lots of data attributes available which you can view within an individual contact record – duration of page views (in minutes) is a good one. You can apply segmentation rules based on these attributes, too. creating an abandoned browse campaign should be on your radar. Obviously, it’s impractical to set up triggers for all products; select a popular high-value product, or a product with a big margin, as a first step when testing the abandoned browse waters. Ready for the next level? Why not set up an abandoned browse based on a set of more generic rules like total number of WebInsight collections or a ‘url contains’ rule. (!) Just remember to exclude anyone that has already purchased! If you are storing your products in our insight data collection (this product catalog will sync over as part of our commerce connectors: Magento, Shopify Plus, WooCommerce, BigCommerce, Shopware, and Salesforce Commerce Cloud), then once you begin tracking web behavior you can start using most viewed and trending product recommendation blocks in either BAU campaigns or in automated triggers. The content block will dynamically update with the latest most-view products based on the logic you set. 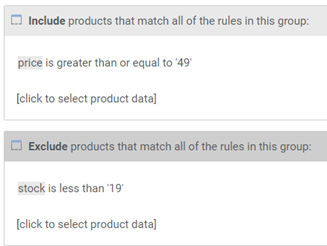 For example, ‘only show most viewed products over a certain price’ (and if you have stock levels, you could exclude any products that have a low inventory). If you have an online store, get your subscribers to create an account using a dynamic content block that’s only visible to them (and not customers). This email campaign would have a light touch and is about getting your contacts to come back to your site to create an account and/or make a purchase. Engagement Cloud is powerful, but we can’t collect web behavioral insight unless you tell us to with a simple piece of script. To find out more about implementing web tracking on your site, check out our Knowledge Base here. from an email) and store it in a web insights collection. There are many web behavior attributes available for use, this overview should help you learn more about them and web behavior in general. Want more information on WebInsights? Speak to your account manager today. The post 3 ways to drive conversions with web behavior data appeared first on dotdigital blog. This entry was posted in Social Media Syndication and tagged behavior, conversions, Data, Drive, Ways by jeffriseo. Bookmark the permalink.